Put the word food next to fest, and it should be music to my ears, but lately, some of the food festivals have left me feeling less than satiated. You pay a lot of money for small bites of food that you wait in insanely long lines to receive. The food often runs out, and you find yourself looking for the closest Taco Bell on the way home. 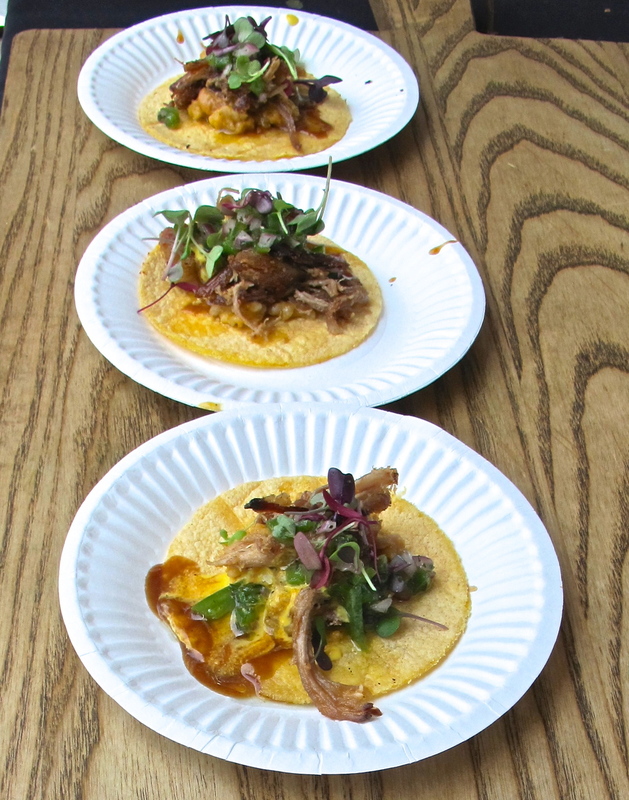 So it was with some apprehension that I bought a ticket for LA Weekly's Tacolandia. The ticket was only $20, so I figured it wasn't a huge investment to see if I'm officially done with these type of events. There was a line to enter when I arrived, but it moved quickly and lines weren't long to get food once inside. Over 30 taquerias had their trucks or were set up in booths next door to the Hollywood Paladium. I was expecting to receive 3 coupons to exchange for a tiny taco, but everything inside was included, except if you wanted to partake in the tequila and beer drinking. So far, so good, but it was time to taste the tacos. I started with Leo's Taco Truck who was shaving el pastor (pork) right off the spit. They had a pineapple on top that they'd cut a piece from and fling onto the plate with some flair. I liked the added sweetness it brought and the pork was well flavored. I was happy to get my taco early from Mariscos Jalisco since the line grew considerably as the day went on. As I waited, I spoke to the owner who set up shop in East Los Angeles 11 years ago. When I asked if he was serving a shrimp taco, he said, oh no, it's more special than that. Seeing people walk by with their tortillas stuffed with shrimp, I was intrigued, but waited patiently for my turn. This taco was served in a warm, crispy shell that tightly embraced succulent shrimp. Fresh avocado was slathered on top with two different types of salsa, producing a well thought out range of flavors and textures, all equalling one of my favorite tacos of the day. Sol Mexican Cucina out of Newport Beach gave me a brief taco break with their white corn tostada with goat cheese, chipotle piloncillo, sea salt roasted peanuts and cilantro. I could have eaten a plate of those. The goat cheese was a nice touch and fun idea for an appetizer at home. The folks from MexiKosher served up another unique taste with matza albondigas in a rich chipotle sauce with tumeric rice. This was a top 5 taco for me with its bold flavors, though you'd fill up on this after a few bites. Chichen Iza serves up some truly succulent pork, topped with a piece of crispy pork skin on top. Kokopelli may have made the longest trek coming from Tijuana, but I think it was worth the effort as they had fans lined up and around their large grill, waiting for portabello tacos or the big hit, kraken tacos with warm tortilla, cheese and diced octopus. Definite contender for best taco. It was nice to see Bistro LQ at the taco fest. I haven't been able to eat the cuisine of Frenchman Chef Laurent Quenioux since he left the westside for Pasadena. Chef Quenioux was at Tacolandia helping serve up rabbit in green mole with a carrot pico de gallo, and I asked if he had any plans for the westside. Unfortunately he doesn't right now, but he is opening two bakeries in downtown LA, so be on the lookout for some great French baked goods soon. There were other notable chefs present like Ricardo Zarate who now has 3 restaurants to his name with Picca, Mo-Chica and the newly opened Paiche in the Marina. I thanked him for his nice addition to the westside. He used to live near the Marina and knew what a food desert it was, so was happy to bring some great cuisine to the area. He brought to Tacolandia some rich and fatty pork belly, along with a tomatillo and huacatay sauce that I had to refrain from picking up the jar and drinking straight up. Jon Sedlar from Rivera had the right idea. He came to eat, and not work. I followed him to George's at The Cove. I hadn't heard of George. His restaurant is in La Jolla and after one bite of his snapper taco, I was ready for a road trip down south. The snapper was cured producing a soft, cool bite filled with pineapple salsa, avocado, cilantro and cabbage rounding out the fabulous bite. Winning taco of the day. Tacolandia restored my faith in the food festival. It was a great value for $20 with unlimited tacos from 30 stands, water, juices and other non-alcoholic drinks. There were mariachi bands, places to sit and people from LA Weekly walking around taking trash from people. It was orderly, and while the lines did grow throughout the day, it provided a nice respite to catch your breath and get ready for the next bite. I'm looking forward to this annual event. Ole!